Pope Francis could visit a children's hospital or youth prison when he makes his trip to Philadelphia in September, according to a Catholic archbishop organizing the visit. Archbishop Bernardito Auza revealed proposed plans for the pontiff's United States tour to the Catholic News Agency during Pope Francis' stop in the Philippines. NBC10 previously confirmed Pope Francis will spend three days in Philadelphia from September 25 to 27. He will take part in the World Meeting of Families conference and will deliver Sunday mass on the Benjamin Franklin Parkway. That mass is expected to draw 2 million people to the city. The pope will take part in a prayer vigil and meet with families while here. Auza said the trip would also likely include "a visit either to a children’s hospital or a juvenile prison." 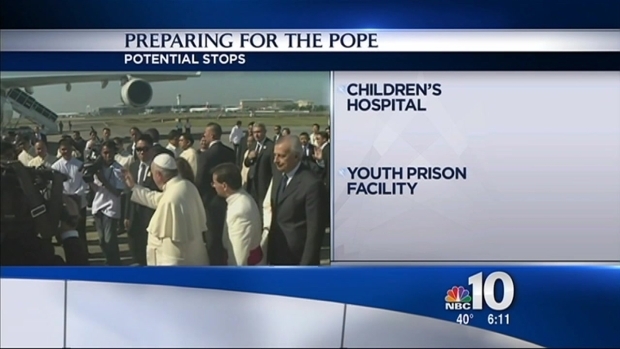 According to an Archbishop helping to organize the trip, Pope Francis could visit a children's hospital or a youth prison. 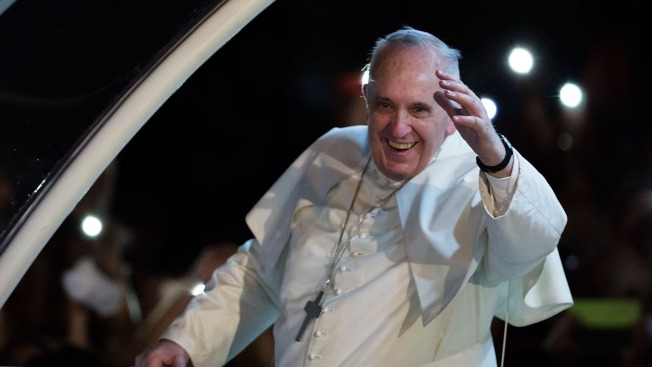 The Pope is expected to visit Philadelphia in September 2015 for the World Meeting of Families. Before arriving in Philadelphia, Pope Francis will spend several days in Washington D.C. and New York City. The pontiff confirmed Monday that he would be attending those cities before stopping in Philadelphia. He will arrive in Washington in the evening on September 22 and meet with President Barack Obama at The White House the next morning, Auza told the CNA. He's expected to speak at a special joint session of Congress and say mass at the Basilica of the National Shrine of the Immaculate Conception. There he will also canonize Fr. Junipero Serra, the pope said. Pope Francis will then travel to New York on September 25 and speak before the United Nations, the archbishop said. He could deliver a mass at Madison Square Garden and visit Ground Zero as well. The pope also discussed a desire to start his North American tour in Mexico, but said it's probably not possible logistically. "To enter the USA from the border of Mexico would be a beautiful thing, as a sign of brotherhood and of help to the immigrants," Pope Francis said. The 78-year-old pontiff's visit to the United States will be his first since being chosen to lead the Catholic Church in 2013. Despite the release of information by organizers and the pope himself, a spokeswoman for the World Meeting of Families and the Archdiocese of Philadelphia could not confirm the details saying nothing has been finalized. She said The Vatican will formally release the schedule at its discretion.